Bristol Council has a ongoing consultation on 20 mph limits. We live in the city and want one which is good to live in. Our children walk and cycle round the city, and we like them to come home alive. A defensible study on the 20mph zone concludes that it directly saves lives. If you live in the Red Zone, you want the council to do things to get people using cleaner transport options than driving, and this and RPZs, along with more aggressive actions, are needed here. In the Important Car for Important People, driving at 20mph is no harder than driving at 30 mph; fuel consumption (in a vehicle which turns off its engine at lights and in traffic jams), the same. Now, regarding the consultation, there's a large list of roads where raising the limit is being considered. This proposal is fundamentally wrong. The roads they propose are the roads people cycle on. They are the roads children walk to school on. They are the roads which anyone walking round the city has to walk on and/or cross. Some of them actually have schools on. Many of them are shopping streets, where encouraging people to visit and walk to shops, even across the road, is much more important than a nominal peak speed of 30 mph. Everyone who lives in that inner city, and wants their streets to be more than rat-runs for the suburban visitors, should get their opinion in, support the proposals as is *and argue against changing the limit on any road in the zone. Changing the limits will massively increase the costs, as now every 20mph-30mph turnoff/junction will need speed-limit-changed signs (go to portsmouth to see this). And at peak hours it will do nothing for journey times. Why then the proposal? And why the choice of roads? Presumably Marvin Rees & team are trying to keep some groups of people happy. But whom? Well, one little reference is to "stakeholders". And what do the majority of those listed roads appear to have in common? FirstBus buses run on them. Looking at that list of roads, comparing it to a bus map, and its hard to conclude that the names aren't from firstbus, and are driven more by their belief it will help scheduling than any concerns about the safety and wellbeing of the inhabitants of Bristol's 20 mph zones. If you don't want FirstBus to be setting speed limits in Bristol, make your opinions known ASAP. 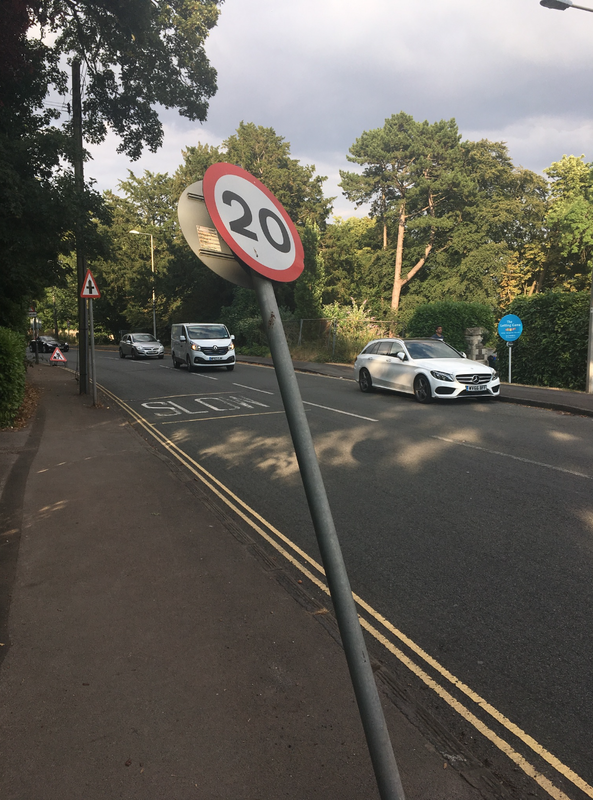 Photo: the 30mph/20mph boundary on Bridge Road approaching the suspension bridge from As, someone clearly didn't see the speed limit sign and decided to go straight into it. That road isn't on the review list, while nearby roads (Pembroke Road, Clifton Down) are. But then, FirstBus buses aren't allowed over the bridge, are they?